Sometimes when I can’t sleep, if it’s just early enough (or late enough depending on who you ask) I will wake up, make coffee, light a candle, and read the newspaper. The world is silent, and in some small way I feel transported back 100 years. What I love about these quiet hours (despite my sleep deficit) are the wandering paths my brain follows guilt-free as everyone catches zz’s. “All great writers hold mirrors to their readers. In Proust’s case, he holds a magnifying glass, not to showcase the blighted peculiarities of his characters but to introduce us to one character we might recognize but are not always eager to know better: ourselves. To read Proust and not to find ourselves in every paragraph is simply to misread Proust. To read him is to learn that we are never introspective or candid or, for that matter, bold enough to admit what we feel, much less what we want. — Wall Street Journal: Why All the Fuss About Proust? And so, thanks to my iPad, within minutes I downloaded the Kindle version of the book and skipped straight to the famous “madeline and tea” excerpt. I have become obsessed with macaroons lately (thank you insatiable sweet-tooth!) and I often experience an equally blissful response upon first bite — but what I particularly appreciated was Proust’s exploration of inner seeking, innate truth, and the imperative not just to seek but to create. Many years had elapsed during which nothing of Combray, save what was comprised in the theatre and the drama of my going to bed there, had any existence for me, when one day in winter, on my return home, my mother, seeing that I was cold, offered me some tea, a thing I did not ordinarily take. I declined at first, and then, for no particular reason, changed my mind. 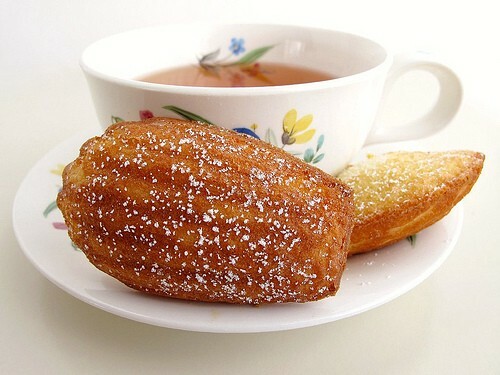 She sent for one of those squat, plump little cakes called “petites madeleines,” which look as though they had been moulded in the fluted valve of a scallop shell. And soon, mechanically, dispirited after a dreary day with the prospect of a depressing morrow, I raised to my lips a spoonful of the tea in which I had soaked a morsel of the cake. No sooner had the warm liquid mixed with the crumbs touched my palate than a shudder ran through me and I stopped, intent upon the extraordinary thing that was happening to me. An exquisite pleasure had invaded my senses, something isolated, detached, with no suggestion of its origin. And at once the vicissitudes of life had become indifferent to me, its disasters innocuous, its brevity illusory — this new sensation having had on me the effect which love has of filling me with a precious essence; or rather this essence was not in me it was me. I had ceased now to feel mediocre, contingent, mortal. Whence could it have come to me, this all-powerful joy? I sensed that it was connected with the taste of the tea and the cake, but that it infinitely transcended those savours, could, no, indeed, be of the same nature. Whence did it come? What did it mean? How could I seize and apprehend it? I drink a second mouthful, in which I find nothing more than in the first, then a third, which gives me rather less than the second. It is time to stop; the potion is losing it magic. It is plain that the truth I am seeking lies not in the cup but in myself. The drink has called it into being, but does not know it, and can only repeat indefinitely, with a progressive diminution of strength, the same message which I cannot interpret, though I hope at least to be able to call it forth again and to find it there presently, intact and at my disposal, for my final enlightenment. I put down the cup and examine my own mind. It alone can discover the truth. But how: What an abyss of uncertainty, whenever the mind feels overtaken by itself; when it, the seeker, is at the same time the dark region through which it must go seeking and where all its equipment will avail it nothing. Seek? More than that: create. It is face to face with something which does not yet exist, to which it alone can give reality and substance, which it alone can bring into the light of day.